An air ambulance service wants to hear from former patients who would be willing to help it raise the £3m a year it needs to stay airborne. The Kent, Surrey and Sussex Air Ambulance wants to get personal stories from people it has helped to publicise the service on its website. Because of patient confidentiality, it does not always know the identities of patients it takes to hospital. It said patients could remain anonymous if they wished to do so. "We would like to talk to as many former patients as possible," said a spokesman. "We rely solely on voluntary donations to survive, and therefore personal stories are a great way for us to promote the valuable and vital work we carry out." The Kent, Surrey and Sussex Air Ambulance operates two helicopters, based at Marden, Kent and Dunsfold, Surrey. The service was begun in Kent in 1989. 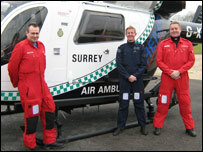 The second helicopter, to serve Sussex and Surrey, was launched in June 2007 following a £500,000 appeal in the two counties.